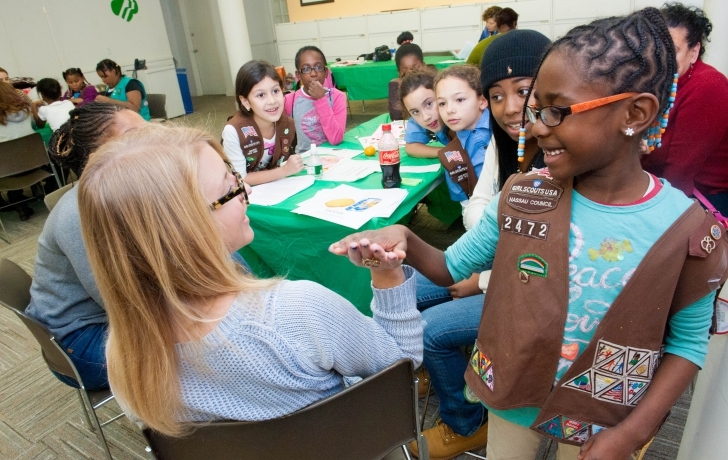 The Girl Scouts are coming to FiDi—with a lot more than cookies. After more than 25 years in the Flatiron District, the Girl Scouts of Greater New York, which currently serves more than 29,000 girls, will move their headquarters next week to a new 17,500 square foot space at 40 Wall Street. With it will come a center for training volunteers and what the organization calls its “girlspace,” a place where thousands of girls each year, ages 5 to 17, will gather from around the city to find community service projects, learn how to manage money, connect with mentors and, yes, sell more cookies. It will also be a sanctuary of sorts, a place where girls can “do activities and have important conversations together in a girl-only sort of environment that’s free of judgment, free of competition,” said Barbara Murphy-Warrington, the organization's CEO. Murphy-Warrington said the girls will find emotional support there, as well. “Our girls, regardless of their socioeconomic background, have issues around parental conflict, sibling conflict, confusion about their emotions and they feel safe to bring that to the troop leaders, to other girls in their troop,” she said, noting that many girls come to her, too, to share their problems. Then there is “Cookie University,” where the girls are taught basic principles of marketing and business management before hitting the pavement with their Thin Mints and Samoas. Girlspace can accommodate up to 50 girls. There, they will use computers to find community service projects and work with programs in science, math and technology offered in partnership with the New York Hall of Science. The girlspace can also open into an adjoining room, providing capacity for large social events with as many as 150 people. Facing a tripling of its rent on West 23rd Street, the organization looked at some 100 spaces last year before choosing 40 Wall Street for its easy subway access and 4,500 square feet of additional, much needed space. “The demand for Girl Scouting in the city has exceeded our capacity to respond to it,” Murphy-Warrington said.